I have to admit, Melon Mambo was my absolute favorite pinks for a long time.. I know its isn't too new to the SU Color Family, but it seems like when I need pink, I go with Melon. Weird, because, I really am not a pink gal. I like it every once in a while, but I am trying to use it more... like 5 other colors I continue to stare at and never use! So, I kept it simple. I used the Melon Mambo along with Crumb Cake DSP, then punched the large scallop circle in Melon. I used Melon ribbon along the bottom. I stamped the En Francais background stamp on Crumb Cake then cut 4 layers of the Big Shot Island Floral die, crumbled them and then cut them in half. I used the itty bitty flower punch for the center and attached all with a brad. 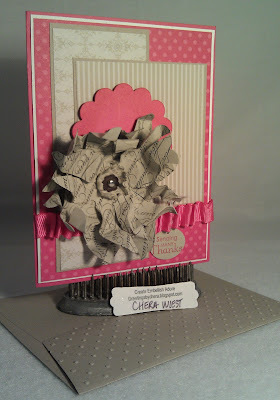 I am trying to make sure when I make cards, I do the envelop as well, so I ran the Crumb cake envelope thru the polka dot embossing folder for the Big Shot. Great design, love that flower!